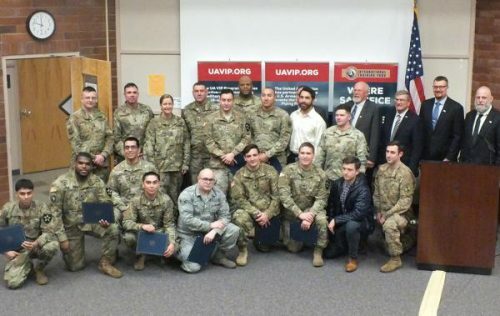 The UA-VIP Joint Base-Lewis McChord Welding Class 16 and HVAC-R Class 15 held a combined graduation ceremony to honor transitioning active-duty military service members. The UA VIP Program currently operates nine programs at seven different military installations throughout the country. This program serves active-duty military service members of the U.S. armed forces who are planning to transition from military service. The UA VIP Program is free of charge to participants who receive career training in one of three disciplines: welding, fire sprinkler fitting or HVAC-R. The UA VIP Program helps decrease the number of military service members that are unemployed after separating from the military and also reduces the manpower shortage in the construction industry. The shortage is a combination of the effects of an aging workforce, increased demand for workers and the lack of skill training for our youth.